Flirtation Walk, the first book in the three book series Journey of Cornelia Rose finally completed the editing phase! For some time, I thought I would never be able to say that! It was a marathon, not a sprint. My editor, Kimberly Goebel and I have been cramming in work sessions, in every available opening in our schedules. On Monday it looked like we were going to be able to finish. 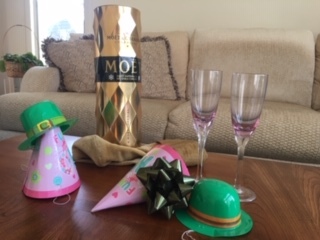 I got prepared: a bottle of champagne, some party hats, some noise makers and streamers. We ran out of time (our “day jobs” calling) when we were only 16 pages away from the end of the book! But Kimberly and I are nothing if not resourceful. The last 16 pages were completed over the phone: I, perched on a chair in a borrowed conference room after a business meeting listening, and Kimberly at her kitchen table, before heading out to another job reading the last pages aloud. Together made the last tweaks. We only had seven minutes to spare before we were both supposed to be elsewhere when we finally, really, finished. The book is done! No time for champagne, let alone party hats and noise makers.This is the way the editing ends, not with a bang but a whimper, to paraphrase T.S. Eliot. No time for fanfare. To date, this is the way my ‘writing career’ has evolved. My passion to write has been crammed into the already crowded schedule, a few hours here, 15 minutes there. But my drive and my “Germ-ish” persistence (part German part Irish heritage) has kept me plugging away. I have proved the axiom creativity is 1% inspiration and 99% perspiration true. My bullheadedness turns out to be a great asset in achieving my goal to be a writer. (C) Jane F. Collen April 5, 2019 IndexCardCure one small step at a time. Congratulations! That is a wonderful achievement! !